Oh my goodness, we had so much fun with Morgan and Alex’s wedding day! 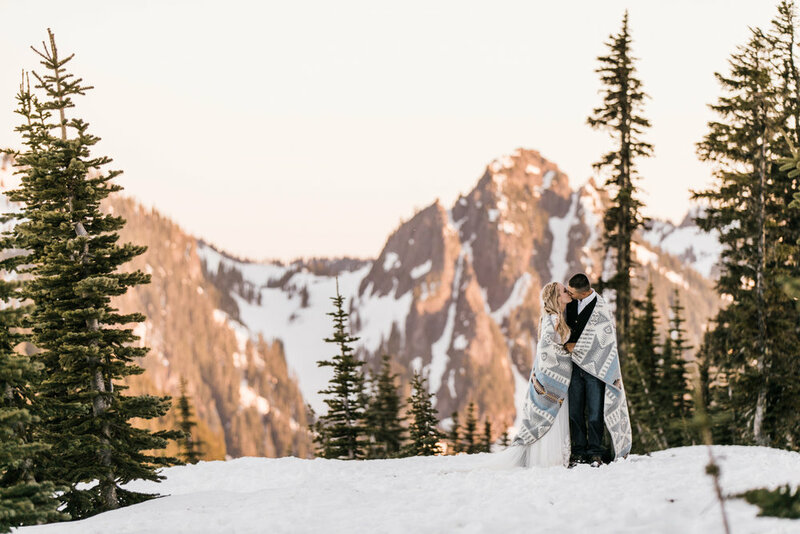 After loving their adventure engagement session with us in the Hoh Rainforest of Olympic National Park, these two invited us to join them for their intimate wedding day in Mount Rainier National Park. Side note: Morgan - I’m thinking we should do a one year anniversary session in North Cascades National Park so we can cover all of Washington’s gorgeous National Parks ;) A few months before their wedding day, we all realized it would still be super snowy at the location we had planned for their intimate ceremony, so Morgan, being the most chill bride ever, shrugged it off and figured we’d pick a spot week of. As it turned out, the cabin they’d rented on AirBnb had a gorgeous lawn with perfect little wooden benches next to a rushing creek. It made for the perfect ceremony setting in the woods and was even visited by a family of deer minutes before they began (if that isn’t good luck, I don’t know what is!). One awesome element of their ceremony was a surprise from Morgan to Alex - he’d always loved violin and joke he was going to just buy one one day and teach himself to play it! 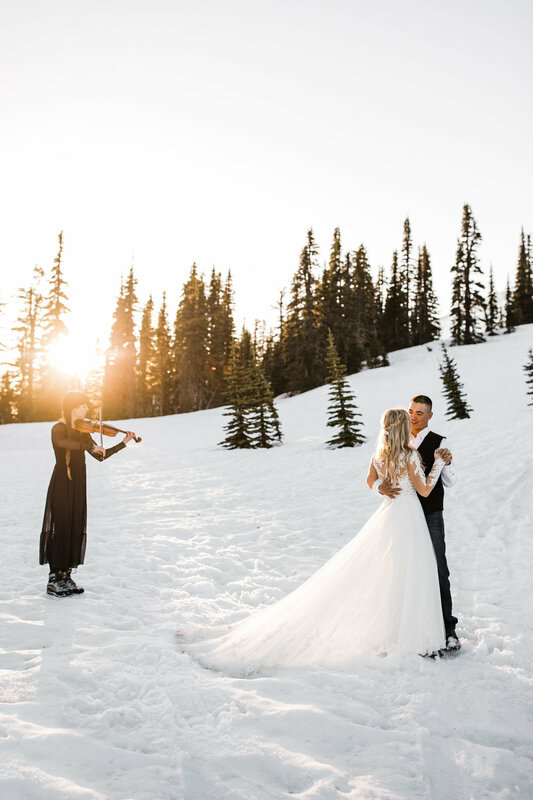 After seeing me post about a mountaineer violinist I followed on instagram (yes you read that right, Anastasia plays violin on mountains) Morgan arranged for her to play during their ceremony. Alex was so surprised when the live violin began as Morgan came down the aisle. 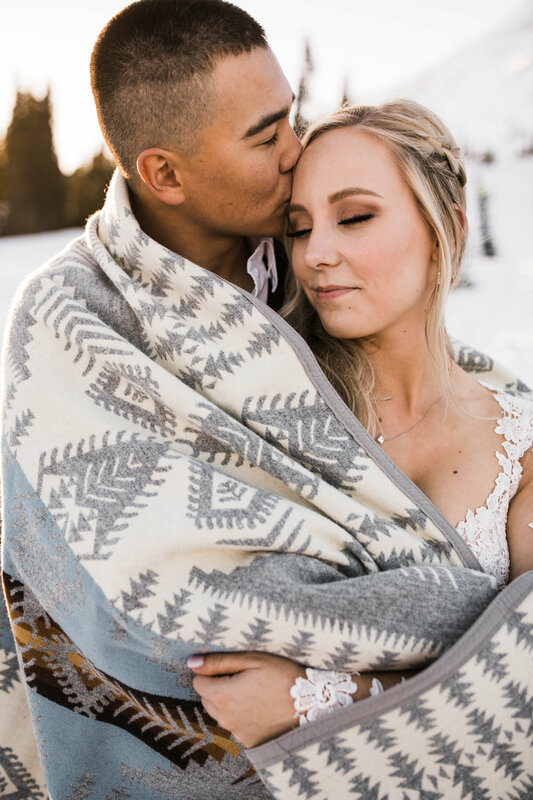 Their ceremony was so sweet, and after a meal together and cutting their cake, their family began the celebration at the cabin while we made our way up the mountain for some sunset portraits. The snow ended up being so gorgeous and Morgan and Alex didn’t think twice about throwing on some micro spikes to make their way up the slope. Anastasia joined us as well and played a gorgeous song for their first dance high on the mountain. 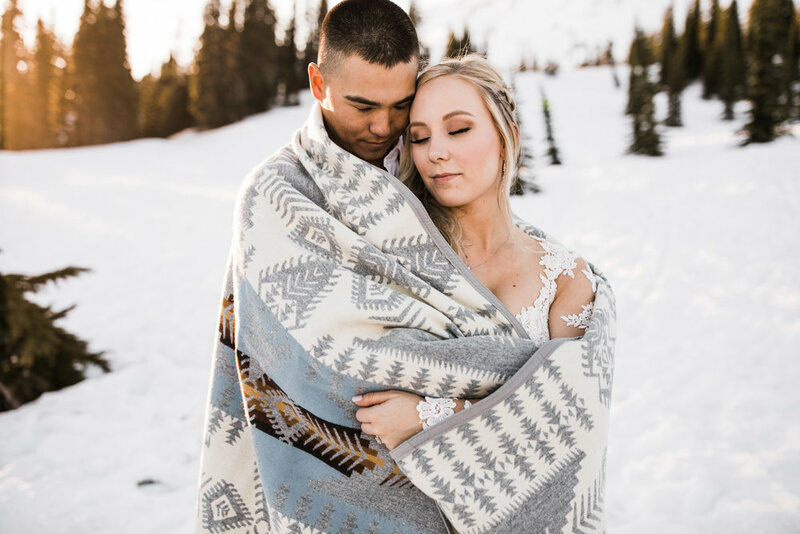 As the temps began to drop, they pulled out their wedding gift to each other, a gorgeous wool Pendleton blanket and wrapped up for the remainder of the photos. The sunset was absolutely gorgeous and as the day ended, we all agreed it couldn’t have been more magical! We all hiked down as the last bit of light painted the skies around us a dark purple. Morgan and Alex were kind enough to invite us back at the cabin for a campfire, drinks, and more cake! Charlie even got to join ;) We ended up parking the van in their driveway that night and when we woke up with a classic wedding photographer hangover (no, not from drinks, just from working on your feet all day!! ), they served us a delicious breakfast and sent us on our way with leftovers in hand! It was such a wonderful day and we felt seriously loved and thankful to work with Morgan and Alex and their amazing families! 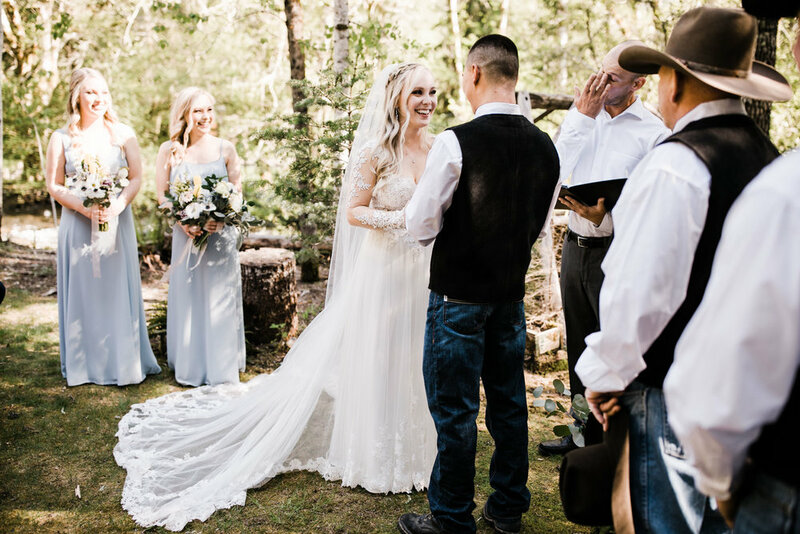 For couples planning an intimate wedding with just a handful of guests in a beautiful location, we reccomend looking through AirBnB for a cabin that might serve as your getting ready, ceremony, and reception space. Some of these bigger cabins can work perfectly as a "wedding venue" if you're inviting anywhere from 5-20 people to your wedding. Morgan and Alex's wedding cabin even had a separate suite for Morgan to get ready in that they used a their own suite that night. It was a great way to keep everyone on-site/nearby (some of their guests stayed in an additional cabin a few houses down), and allow all the events to take place close together. Having their ceremony there worked out nicely too, keeping the timeline flexible and simple. 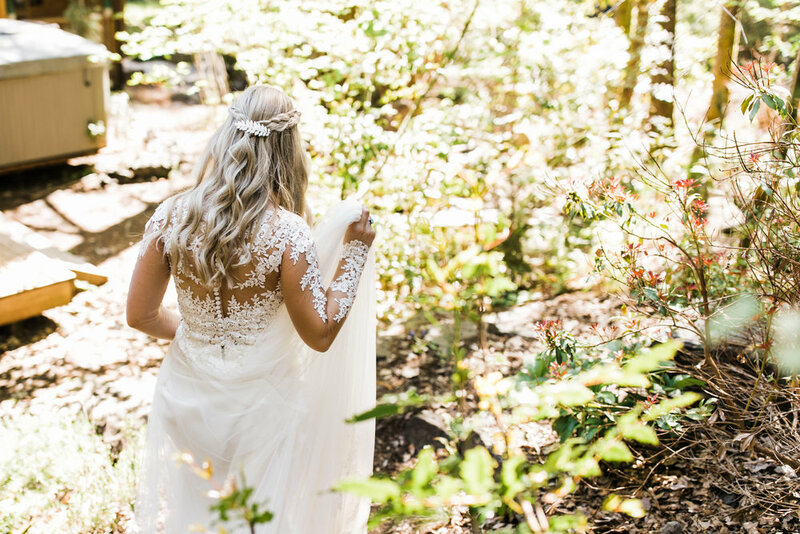 If you're planning your wedding in a National Park or some other rad place, feel free to reach out to us for cabin suggestions - we can often tell which ones will work well as mini-venues and which ones won't!